Your District. Your Voice. Your Vote. We’re ready to #CreateTheChange on August 7th—are you? Help us bring our progressive movement to Washington by knocking doors and making calls these last two days of the primary! Join the team at benac2018.com/organize! ☎️ With just two days left until the August 7 primary, we need YOUR help to spread the word about our grassroots, people-powered campaign! We are phone banking at the Kalamazoo campaign office today until 8 PM and would love to see you there! Can't make it in? Visitbenacforcongress.com/call to learn how to phone bank from home! Shaun King endorses our Campaign! 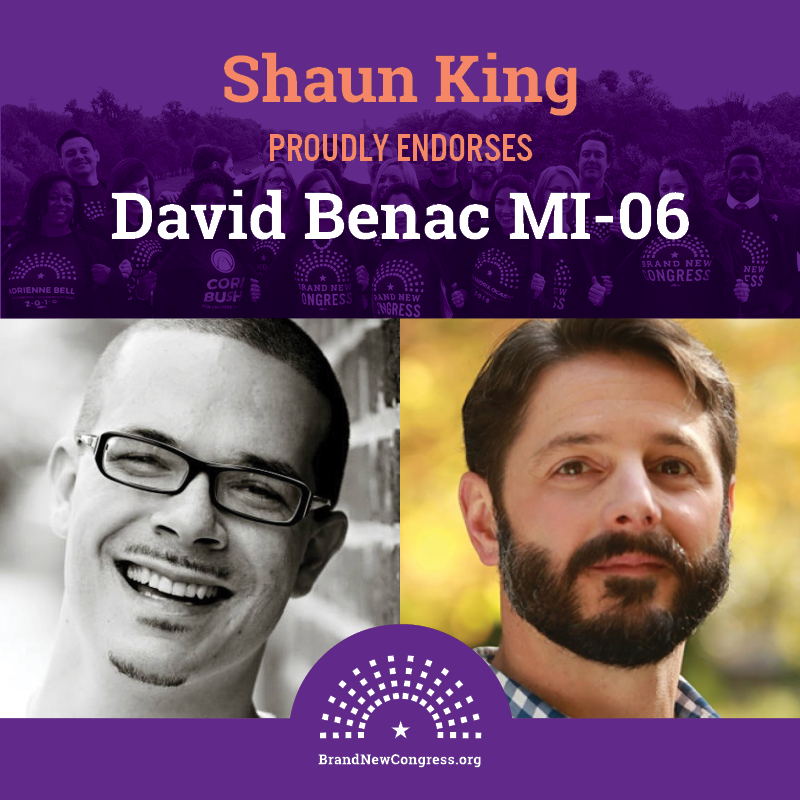 I am proud to have earned the endorsement of Shaun King. As your representative in Congress, I will work with him and other strong activists for civil rights and criminal justice reform. Black Lives Matter. I have been lucky to receive a world-class education entirely within the public school system and to have spent my entire teaching career in public education. As your representative in Congress, I will use my experience to make our public education system the best in the world. No student will face inequalities of educational opportunity regardless of the right to pay, at any level, from pre-k through college. Every student will have the physical, digital, nutritional, and mental health resources needed to reach his or her full potential. Our public schools will train the next generation of world leaders, scientists, artists, educators, and skilled trades workers who will shape our future. Our Revolution's Get out the Vote Rally! A huge thank you to Berrien County Our Revolution and all the wonderful speakers who participated in yesterday’s Get Out the Vote rally! We started our movement at the beginning of May 2017 and now we are here, less than a week until the primary election. Since day one, this campaign has been about getting people energized, involved, and ready to vote for change and for a better democracy. We had over 80 people show up last night to rally for the future. We only have a few days left. Convince your friends, your families, you neighbors, and everyone you meet to get out an vote next Tuesday. It's time to take back our democracy! A big thank you to the St. Joseph County Democratic Party for hosting the final candidate forum before the August 7 Primary. I was thrilled to attend and answer questions from the community about our progressive campaign. Thanks also to River Country Solidarity. Phonebank with #TeamBenac! We need volunteers! We need YOU to help us get out the vote for the August 7th primary! Please join #TeamBenac at our Kalamazoo campaign office EVERY DAY for a phone banking session from 5:30-8 PM. Just bring a phone and laptop and we'll provide the training! Can't make it this week? You can still help out by making calls from home! Visit benac2018.com/phonebank for a how-to guide and call script! Sunrise Kalamazoo endorses David Benac! #TeamBenac is very proud to receive the support of Sunrise Kalamazoo! David is optimistic about the future of our country because of young people who are willing to pursue ambitious causes and who refuse to accept the corruption that plagues the status quo. That is why he firmly supports the Sunrise Movement and will continue to work alongside them to eliminate the influence of fossil fuel companies over our democracy! Don Cooney endorses David Benac! 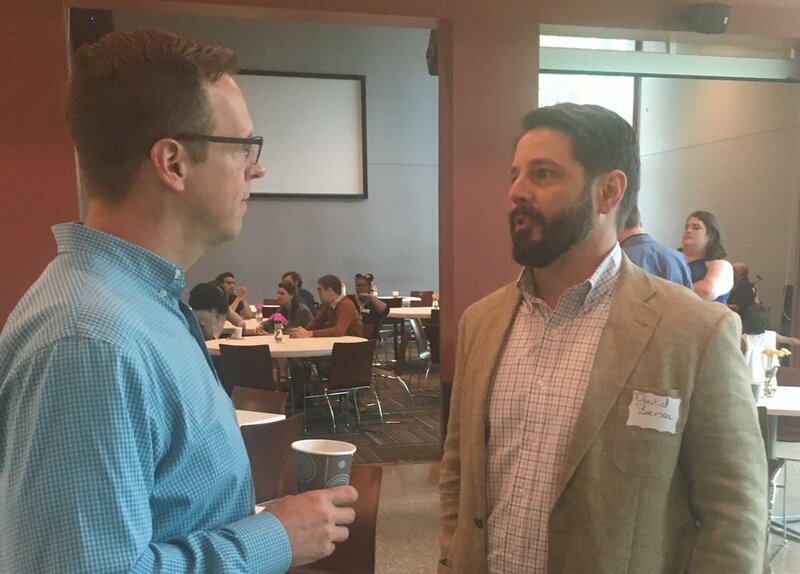 When people ask David who in the 6th District is the individual he considers his political role model, the answer has always been easy: Commissioner Don Cooney. Commissioner Cooney has lived a life of principle and has never shied away from putting himself on the line to support the most vulnerable and has always worked to lift up the entire community. Thank you, Commissioner Cooney! David is proud to be a lifelong union member, an elected union representative, and to have the endorsement of Local 4032 of the Communications Workers of America. In the last year, he has stood in solidarity with the Communications Workers of America, nurses at Borgess, and his teachers’ union in labor actions while also supporting the efforts of the Teaching Assistants' Union at Western Michigan University to win a more equitable contract. As your representative in Congress, David will fight to guarantee that all workers have the right to organize, elect their leadership and bargain collectively. We need a Wagner Act for the 21st Century! You can read our full workers' rights policy statement at benac2018.com/labor. Communications Workers of America endorses David Benac! As a union representative, David is proud to have earned the endorsement of his brothers and sisters in labor. He has stood shoulder to shoulder with workers in protest of corporate overreach many times, including last year with the Communications Workers of America in front of a Verizon store in Portage and earlier this year with CWA workers outside of an AT&T facility in Kalamazoo. As your representative in Congress, he will continue to fight for the rights of all workers to organize, elect their own leadership, and bargain collectively. David is #UnionStrong! Canvassing with #TeamBenac: Knocking on a door near you! The last couple days have been busy for #TeamBenac. We're picking up the pace on our canvassing and heading all over the district for events. In just the last couple days we spent time volunteering at the Huss Future Fest in Three Rivers, supporting the 60th District Service Office of State Representative Jon Hoadley, and participating in candidate forums in Benton Harbor and meet and greets in South Haven. This is what it will take to #CreateTheChange and win back our seat in Congress! Bill Farmer is a powerful advocate for the rights of all working-class Americans and we are honored to have his support for David's candidacy and our people-powered movement. You can read Bill's full letter of support below. Thank you, Bill! "David Benac is the only candidate running for Michigan’s 6th Congressional District who unabashedly supports the concept of and process involved in transitioning to a Single Payer Healthcare system. He has also committed himself, once elected, to pass House Resolution 676, the Expanded and Improved Medical Care Act. Benac’s commitment to Single Payer Healthcare proves he understands the way to solve our healthcare crisis is to end the profit motive that drives it. He understands that the wealth generated by our economy, when critically applied, will solve not just our Healthcare Crisis, but other issues which so ardently need mitigation. With this perspective and understanding, Benac understands the systemic problems underlying and reinforcing the economic and social justice issues we have all be fighting to correct. No one should be refused healthcare because of their inability to pay. Single Payer Healthcare/Extended and Improved Medicare for All rips away the threads of privilege, racism, and sexism, and ends the moral bankruptcy of our 'for profit' healthcare system. This is the kind of leadership which can lead us away from the inequality we face today. If we are to build a better future today, economic and social justice advocates need to continue to build independent grassroots movements and at the same time support electoral candidates, like Benac, who possess a critical analysis of our systemic problems. This is why I voted for David Benac." Michigan for Single Payer Healthcare has endorsed our Campaign! I am proud to be endorsed by Michigan for Single Payer Healthcare. Enacting a single-payer, universal healthcare system is the most effective way to help the most Americans and spur economic growth. Voting is a fundamental American right. We need to work toward making our elections fair, transparent, and accessible. This includes automatic voter registration, making election day a Federal holiday, ensuring accountability with paper ballots, and enacting vote-by-mail. As your representative in Congress, I will support every effort to overturn Citizens United, end gerrymandering, and remove the corrupting influence of money in politics. Voters must be able to choose their politicians, rather than politicians choosing their voters. Campaign finance reform is essential to ensuring that our elections remain fair and open. We need hard caps on campaign contributions, more transparency, and we need to work toward publicly funded elections. The Cannabis Caucus of the Michigan Democratic Party endorses our Campaign! I am grateful to the Cannabis Caucus of the Michigan Democratic Party for endorsing my campaign to win the MI-06 Congressional District seat and represent the people rather than the donors. Ending the antiquated and racist prohibition of cannabis is a social justice, medical, and economic issue. I will work to de-schedule cannabis, end discriminatory incarceration, provide much-needed medical treatment to veterans and all Americans, and create small business opportunities. #TeamBenac had another busy day. We kept a contingent of the team at the 2018 Black Arts Festival the entire day to show our support for their great work. David started the day off as the only 6th district candidate to show up and address the State Central Committee Meeting of the Michigan Democratic Party. Later, he was honored to attend a meet and greet for the campaign hosted by my friend Jevin Weyenberg at the VFW Post 1527 Red Arrow Post. The team then ended the day with a pints and politics event with voters at Centre Street Tap House. The voters of this district deserve a representative who will work for them every day and who is willing to #CreateTheChange we need to put people before donors! I'm proud to be endorsed by Adrienne Bell, a strong progressive Democrat who ran an amazing campaign and won her primary in Texas. This is the seed of a national coalition that will energize and build the Democratic Party to #CreateTheChange we need. We need to support our family farmers and build a sustainable agriculture system that is environmentally friendly and will help local communities. This also includes building a system of Rural Broadband, similar to the Rural Electrification Administration that was created in the 1930's.